This review covers the nature, characteristics, and reactivity of soil organic matter (SOM) in volcanic soils and the phosphorus (P) accumulation mainly via the formation of stable complexes with organic and inorganic constituents to form P-containing macromolecules derived from both pedogenesis and fertilization. With the time, P accumulates as organic and inorganic compounds with differing lability, but the bulk appears to be recalcitrant. 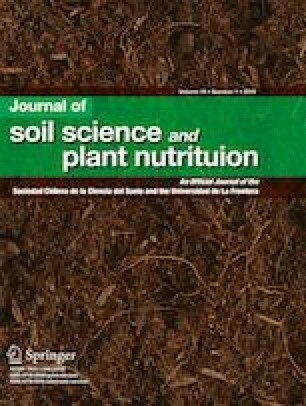 Chilean volcanic soils follow this same trend, subsequently having detrimental characteristics for plant growth, like the highly humified SOM and high P-sorption capacity. In addition, certain Chilean volcanic soils have high acidity, concomitant with a high exchangeable Al. As a result of the continuous application of P fertilizers, together with a low P efficiency of plant root acquisition, a “P reservoir” has built up, giving rise to the so-called residual P. This residual P consists of the inorganic and organic P, as macromolecular structures representing the cumulative average of several decades worth of agronomic P usage. Root modifications are an essential biological intervention to deal with this P accumulation. The general root modifications that are required to mobilize the residual P are discussed in the context of biochemical modifications (root exudations) and the symbiotic alterations by arbuscular mycorrhizal (AM) fungi. For a more efficient utilization of this accumulated P, however, it is essential to investigate the chemical nature and lability of these P forms in order to determine their capacity for plant acquisition and utilization. In this context, attention is focused on P fractionation and on some 31P-NMR analysis of residual P constituents in Andisols. The major root trait evaluated and discussed here is the AM association, which is able to be extensively modified by management practices. Finally, some potential practices to avoid the excessive application of P fertilizers in volcanic soils by using technologies of P recycling, management of AM fungal populations, or agricultural management for mobilizing the accumulated residual P are outlined. In memoriam Dr. José Miguel Barea Navarro. Financial support was received from the FONDECYT 1170264 (P. Cornejo), FONDECYT 11160385 (A. Seguel), and FONDECYT 11170641 (P. Aguilera) grants from the Comisión Nacional de Investigación Científica y Tecnológica (CONICYT), Chile. A. Valentine was supported in Chile by a grant from the MEC Program No80170023 (CONICYT). P. Cornejo also thank to CONICYT/FONDAP/15130015.